← The Relationship: How Do I Love Myself? I need to bond. I am not in this relationship for some shallow interaction. Let’s really take this to the depths of what a relationship is capable of. See, when we first met, it was by attraction. There was a pull and we could not avoid each other. It was there as if we were on an attraction parallel plane that exists beyond normalcy. And whereas, this relationship may not be for the long haul or eternity, because nothing is promised: nor can we forecast how long we will last, but Baby, while we are here, right now? Bond with me. Right now is really all we have. I am vulnerable to you. I am willing to take the risk of vulnerability, because my heart has been tested and tried before you came along. I have learned how to be vulnerable, but not through ignorance or emotional dominance. My fear factor is more removed from the levels where it once dwelled. Navigating through vulnerability takes skill and know how, so I am willing to take the risk with you. When we have conversations, we are smart, insightful, witty, and where we found we have many commonalities, it is not only through our commonalities where we bonded— but also through our differences. It is in our differences where we can really see each other’s brilliance, and through the differing perspectives we share, we take those perspectives as an opportunity to see a different view. So, our differences are never our dividers, our differences are where our levels of respect are built. Through this we found we could bond. Historically, we took different routes to get to our historical awareness, but combined, we are able to see our surrounding life in the reality of what is. Nevertheless, we move forward mentally bonded by the understanding of what we need to be to each other and what we need to do for each other. We bond through historical awareness. Talking about anything without judgment, and with understanding is how we communicate. We have an understanding of our past pain and our need to be supported now. We have shared some of our most painful times, so in understanding our pain, we have entrusted each other and feel safe with each other, via empathy for the pain we have both encountered. Our belief systems are similar: spiritually, socially, economically and politically. Individually we become stronger in our hearts, and our minds through continuous information building. We continue to bond as we grow in knowledge and as we share the knowledge. Various primitive emotional levels we do not encounter in our relationship, like jealousy. There is nothing to be jealous of. We are beautiful as man and as woman, so we complement each other and we affectionately compliment each other. We do not live in fear of losing each other. Regardless of where we go, or how far we may be away from each other, we are bonded on so many levels that the depth of that bond cannot be easily broken or penetrated. Trust? We trust each other with our hearts, because we both share our heart. Sexually together, we are an accumulation of the passion we feel in all our endeavors, along with the need and the craving to have each other. We continually build our sexual knowledge. And we do not fail to share that knowledge together under the sheets or where ever we feel the need to have each other. We build our sexual stamina from many different aspects like; reading about it, eating the right foods, working out, talking about it, wanting to try many things, and the various sexual challenges we bring. We realize in sexing each other, that what we had done before or the night before, was the past, and what we do now, is a builder to the next level of further sexual bonding and pleasure. And lastly, we do not fail to tell each other how we feel about each other. Through eye contact we continually look into our souls, while building momentum off our synergy, and enjoying the power of our combined energy. Energy is never eradicated it is simply transferred. So we take that energy and feed each other in a way that an intimate bond could never really be broken. We are fully present in every moment we share, never to be taken for granted, and never to be in that same moment again. It makes us want more moments together, because every moment we work to make it better than the last. 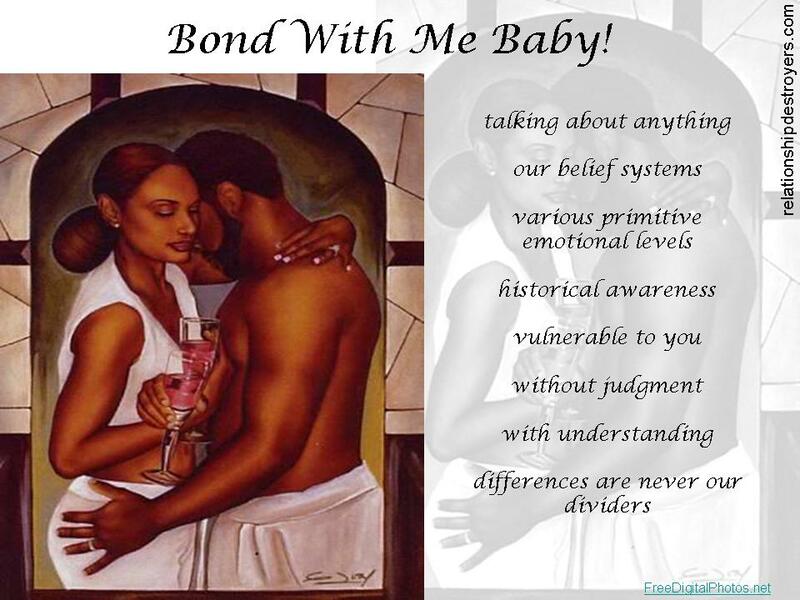 This entry was posted in Actions in Relationship and tagged bonding in a relationship, depth of a relationship, how do we bond, relationship not last forever, vulnerable in a relationship. Bookmark the permalink.